Established in 2001 Herward Dunkel – Lichtdesign is an award winning South Tyrolean manufacturing and custom lighting design consultancy. The Via dei Portici/Lauben-Gasse is a 300 metre long winding street of arcade fronted shops and houses that has been the bustling commercial heart of historic Bolzano in northern Italy since the town was founded in 1180 A.D.
Portici/Lauben is an important tourist attraction for Bolzano and the town wanted to upgrade the outdated and inefficient streetlights with a more cost-effective and environmentally friendly solution. At the same time they wished to retain the existing traditional wall-mounted lanterns that should be restored and modernized while continuing to complement their historical surroundings. Herward Dunkel – Lichtdesign chose LEDiL as their optics partner thanks to the company’s industry-leading and proven portfolio of durable high quality optics. 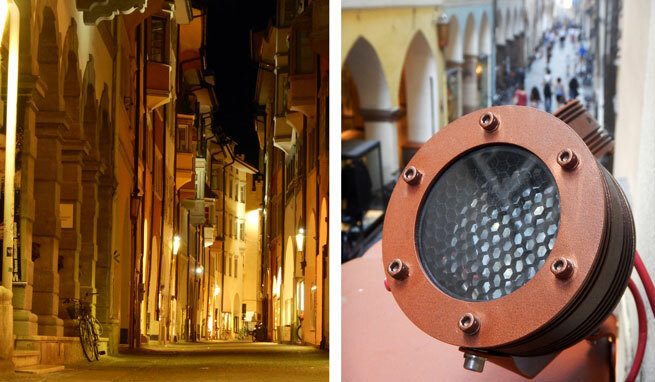 In this case Herward Dunkel – Lichtdesign chose lenses from the LEDiL STRADA family and then embedded their new illumination design into a 2.4 GHz RF smart grid system to allow separate ignition and dimming of road and highlights. The finished result is a charming outdoor lounge atmosphere with both the pavement and surrounding buildings bathed in a non-intrusive warm flowing light that perfectly highlights the unique features of this beautiful street. In addition operating costs have been reduced and the system’s environmental credentials further enhanced with the use of 100% recyclable components.